It's just about time for Thanksgiving and you know what that means. Pie time. Sweet potato, pumpkin, pecan... you name it, it's been done. But I have to admit when Thanksgiving rolls around, I'm not always ready to give up on my first love. There's a reason apple pie is a catchphrase for all things wholesome and good. Apples tucked together and laced with fragrant spices and butter, surrounded by a flaky pastry and delivered into your mouth piping hot. It just doesn't get much better than that. There's just one teensy tiny problem with pie. It's not teensy. or tiny. Pie is a commitment. That's why I opted for this bite-sized version of a butter madeleine instead. 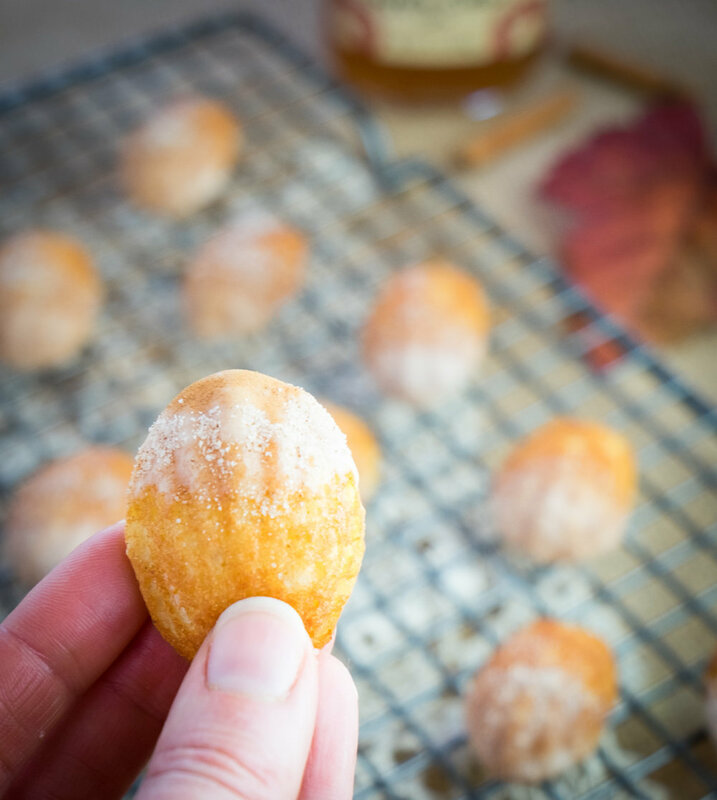 Apple jam infused madeleines dusted with cinnamon sugar give you all the taste of pie without the calorie commitment. If you're not familiar with madeleines, they are a French concoction that lays somewhere between a cake and a cookie. And true to the French, they are rich with butter and yet airy, like little pillows of flavor. Those traditional scallop lines come from a particular mold that gives the madeleines plenty of surface area for crisping. The secret to this batter is that it's built in phases, so plenty of air gets in. You'll melt that butter and jam together into a syrup but it won't get tucked in until the batter's second rise phase. I used a mini-madeleine pan, which makes it quite tricky to get the definition on the molds as they aren't very deep. 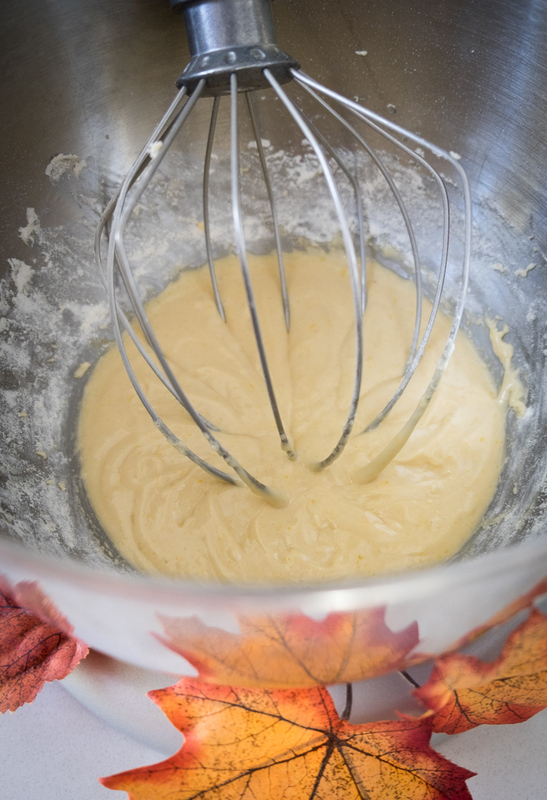 Tap the pan on the counter to get the batter to disperse evenly but don't go too hard or you'll lose your airy rise. When these beauties come out of the oven, they'll be golden brown. Crispy on the outside from all that butter and impossibly light inside. You'll see I'm not kidding when I said tiny. A few of these would fit easily in the palm of your hand. We're going to dip these in a vanilla glaze and then dust them with cinnamon sugar. I opted to do just the edge in a heavier glaze but can coat the whole thing with a glaze. Finished this way, they're a bit like the French version of a doughnut. If you'd like something petite to grace your holiday table this Thanksgiving, may I suggest sticking with a fresh take on a traditional recipe? I think you'll find it brings a certain je ne sais quoi to your menu. Happy holidays, friends. 3. Meanwhile, melt the butter in a small saucepan over medium heat. (Remove and reserve 2 tablespoons of the butter for brushing the pans.) Add the jam and cook, stirring until smooth, about 1 minute more. Remove from the heat and allow to cool, about 30 minutes. 4. Stir the butter and jam mixture into the batter until smooth. Cover the batter and allow to rest for an additional 30 minutes or up to an hour. 5. To make the madeleines, preheat oven to 400°. In madeleine molds, brush indentations with the remaining 2 tablespoons melted butter. Using a teaspoon, fill each indentation in the molds three-quarters full with batter. Tap the pan on the counter to distribute the batter evenly. Bake until deep golden brown, about 4 to 5 minutes. Remove from the oven, allow to cool for 30 seconds, and then tip them out onto a cooling rack. 6. Serve with vanilla glaze and dust with cinnamon sugar. Looking for more dessert inspiration? Follow A Sweet Little Life on Instagram.